Most of this information is based on credit cards issued by financial institutions (banks, companies) in the United States. However, I've used cards all over the world and have found the experience to be very standardized. I applied for my first credit card in 2007 as a sophomore in college. Up until that point, I had used my debit card for all my online and many in person transactions. I read online about getting reward points for purchases and I thought that could be a good way to make some extra cash. I applied for an American Express Blue card, mostly because I thought AMEX was the most badass of cards. My grandfather, one of my heroes, is always rocking the AMEX Platinum. I wanted to be as cool as him. I eventually got a USAA credit card as well in 2008, because they use the MasterCard network, which was accepted more places than the American Express. Since 2008 I've opened and closed several credit card accounts with Citi, Chase, and USAA. I've used Visa, MasterCard, and American Express. I haven't experimented with the Discover network, but I heard good things about it. I closed the original AMEX I got because I didn't understand the value of the rewards program. I've kept my USAA card account open but don't use it for anything but paying my USAA automobile insurance. Because the USAA card is now my oldest credit line, I'll probably keep it open until the end of time, so that it increases the average age of my accounts. (Average age of accounts is 15% of your credit score). Every credit card (except a very few) have a credit limit. This is the amount of money the card issuer trusts you with. For some students starting out, the limit may be as low as $500. For Wall Street bankers, they might have access to $100,000. At one point, as an unemployed college student, my American Express limit was $18,000. Pretty crazy when I only had $800 to my name. Credit cards also come with interest rates attached to them. This scares a lot of people, but you have to realize: if you do it right, you'll never even know what your interest rate is. Keep reading to find out why. Debit cards deduct money from your checking account. They are almost the same as cash. That's it. Simple. No bills, no statements, no delayed payments. You can only spend what is in the account linked to your debit card. Credit cards are only limited by the credit limit. So I could have spent $18,000 on a ski trip to Whistler if I had been real dumb in college. Fortunately for me, I wasn't. Credit cards have a predetermined length of time until a statement or bill is generated. Usually this is four weeks or a month. At this point, all of the transactions that occurred from, say, Jan 1-Feb 2 are tallied up and presented to the card holder (you). You usually have 21 or so days from the time the bill is sent to you to pay the bill. You'll generally be presented with three payment options: minimum due, statement balance, and current balance. This is the dangerous one. Remember that interest rate I mentioned earlier? If you pay this amount, anything that you leave unpaid will start accumulating interest. This is how people get into trouble with credit cards. They only make the minimum payments, which can be as low as $25 per month, while ignoring the fact that they have $1000s of unpaid balance that is now accumulating the insanely high interest rates credit cards come with. If you're smart and don't want to pay the credit card companies anything: DO NOT JUST MAKE MINIMUM PAYMENTS. This is the sum of all of your transactions during your billing cycle. So for instance, your billing cycle may run from the 15th of January to the 15th of February. If you had 10 transactions totaling $100 during that time, your minimum payment would probably be $15, and your statement balance would be $100. This is the sum total of all transactions that haven't been paid yet. It's usually equal to or greater than your statement balance. So for instance, if you had the $100 for 15 Jan to 15 Feb, and then you spent another $50 on 16 Feb, your current balance would be $150. To be extra cautious, you can simply pay your current balance at any time and you will be so far removed from interest charges you'll never even think about them. I always pay my current balance. It's just easier. Possibly the most annoying thing about credit cards is the pending charges. Because of the way the processing network is setup, credit card transactions often take 2-3 business days to process. That means that you could look at your current balance and see $0, while there's $1000 in pending charges waiting to be processed. Annoying! One way to get around this is to look at your pending charges, which will be listed online for most credit cards. Another way is to look at your available credit limit. This is updated almost instantaneously to reflect pending charges. So if your current balance is $0, your limit is $1000, but your available limit is $800, you probably have $200 in pending charges. Remember that so you don't go spending money you don't have! This is how I get around this problem: Any time I make a credit card transaction, I move that amount of money from my main checking account to my “bills” account. That way when I look at my main checking account, I've already deducted the pending credit card charges. Then, every week or so, I pay off my current balance on all my credit cards from my bills account. My credit card balance goes to $0, I know I have the money to pay them in my bills account, my credit card reward points keep increasing, the credit card companies get their little slice of profits, and everyone is happy. Getting your first credit card is often too easy. As a student or military servicemember, you're often a target demographic of the credit card companies. American Express offers military servicemembers no annual fees on all of their cards. I keep a list updated monthly of the best credit card offers I've found. I'd recommend a student card if you are in college or a secured card if you're not. Only charge a few things to it a month and pay it in full every month. You will build yourself a great credit history and thank yourself later for not going into heaps of credit card debt. Great read! I’m a fresh 2D LT in the USAF and I’m contemplating what credit card is right for me and my intentions. I mainly want to use it for paying small bills (utilities), a small purchases and primarily getting points for flights. I am stationed on the east coast and all of my family and my girl friend live in California, so going home when I can, is what I do. I’ve been told AMEX is great for military and racking up miles for airlines. Do you have any recommendations? Hey Bobby, welcome to the AF! Putting small (and large) purchases on the credit card and paying it off before it’s due is the perfect way to accumulate miles. My wife and I usually earn 3-4 free cross country tickets a year. As for recommended cards, I use the Chase Freedom exclusively in the states. For international travel I use the Chase Sapphire Preferred. You can combine the Ultimate Reward points from both cards to maximize your rewards. The CSP does have an annual fee, so unless your job takes you internationally, I’d just start with the Freedom. I actually don’t like AMEX that much. It’s not accepted as many places as Mastercard and Visa. The rewards programs are decent, but not as good as some other programs. AMEX is usually good for sign up bonuses, if you want to play that game. 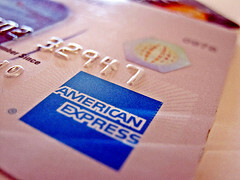 You can get annual credit card fees waived as a military member on most AMEX cards. See my article for more info.